Now this is a fun wedding cake! How often have you seen a wedding cake shaped like a barrel? Never, right? Well now you can say that you’ve seen it all. I absolutely love the charm and humor of this wedding cake from our friends at Hockleys Cakes over in the United Kingdom! The story behind this cake is that the reception was held in a rustic, traditional English pub and the cake was created to reflect the venue. Now that’s a pub I’d like to visit! With the pretty flowers and ivy these have to be the prettiest pub-inspired barrels ever. 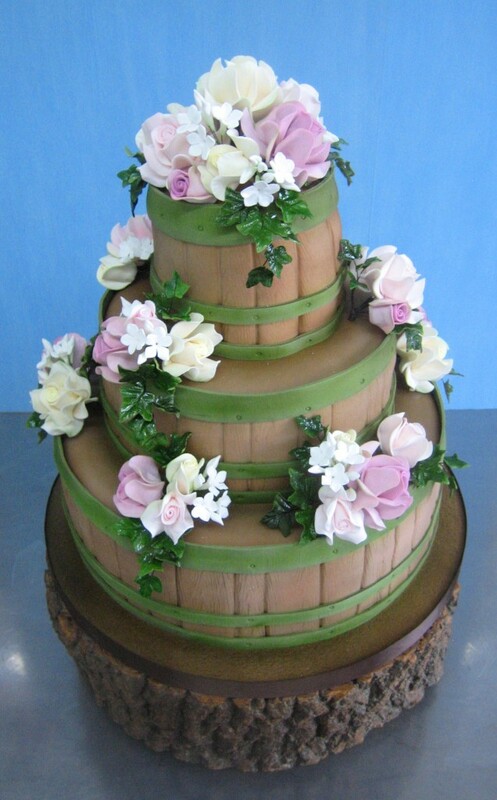 And I love that the cake is presented on a tree stump – it just adds to the rustic theme of the cake. Thanks to our friends at Hockleys for sharing this wedding cake with us.